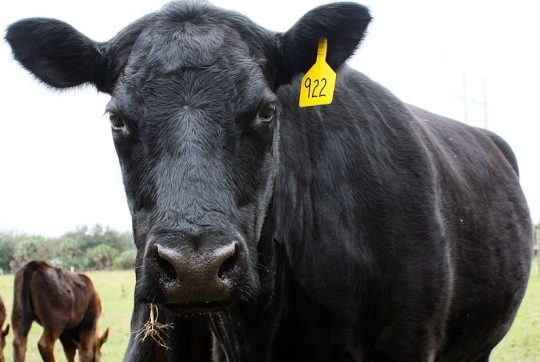 This Black Angus cow is not happy about a study done by Carnegie Mellon University! It always bothers me when people make overly simplistic statements about the issues we are currently facing. It bothers me even more when scientists do it. Nevertheless, I find examples of scientists making overly simplistic statements time and time again, especially when it comes to “global warming,” aka “climate change.” I have discussed at length the overly simplistic way in which some scientists approach climate (see here, here, here, here, and here, for example). Not surprisingly, those same scientists often approach the “solutions” to global warming just as simplistically. The article’s main discussion point is a report issued by a thinktank known as Chatham House, but it discusses several sources in which scientists and policymakers insist that we must reduce our meat intake in order to curb global warming. Why? It seems simple enough. Keeping livestock requires energy, and the livestock themselves produce greenhouse gases such as carbon dioxide and methane. It only makes sense that eating food coming from plants (which consume carbon dioxide and produce little methane) would reduce greenhouse gas emissions, right? Well, a study done by Carnegie Mellon University concludes precisely the opposite! In this study, the authors consider the energy use, greenhouse gas emissions, and blue water footprint* associated with various types of food production. They then correlate those to three possible shifts in U.S. diet. First, they consider what would happen if people in the U.S. would stop overeating and just eat enough to maintain a non-obese body weight. Second, they consider what would happen if we all ate the same amount of calories but shifted to the more healthy diet recommended by the USDA. This would require eating less meat and dairy while eating more fruits and vegetables. Finally, they consider what would happen if we did both. So just shifting to a diet that is richer in fruits and veggies doesn’t help us reduce our supposed impact on climate. In fact, it makes our impact worse. But what if we did both? Would the reduction of calories offset the problems produced by switching to a diet richer in fruits and veggies? The answer is no. If we did both, we would still increase our energy use by 38%, blue water footprint by 10%, and greenhouse gas emissions by 6%. According to this study, then, if we truly want to reduce our impact on climate change, we need to increase our consumption of meat and dairy! How did the policymakers and scientists discussed in The Guardian article I linked to previously get it so wrong? Because they looked at nature too simplistically. Yes, animal products do have a lot of energy and greenhouse gas emissions related to them, but then again, they require a lot less dedicated farmland. This reduces the energy needed to maintain them. It also makes more land available for year-round plant habitation, which should consume greenhouse gases. In addition, meat and dairy products contain a lot of fat, and from a Calorie standpoint, fat is a very efficient delivery system. Each gram of proteins and carbohydrates (the main sources of energy in fruits and vegetables) contains only about 4 Calories per gram. However, fat contains about 9 Calories per gram. So when it comes to Calories, you eat less than half as much fat as you do proteins and carbohydrates. Thus, you eat less food on a diet that is rich in meat and dairy. I am sure there are many other factors that are important, but those are the two I can think of right off the top of my head. Now please understand that I am not saying this study is definitive. It has to make assumptions, and it has to ignore certain processes in order to make the study manageable. If you make different assumptions and ignore different processes, you can come to the opposite conclusion, as one study has done.2 My point is that most policymakers and scientists arrived at their conclusions regarding global warming and food consumption by looking at things in an overly simplistic way. When you actually study the problem in a less simplistic way, you can come to a different conclusion. Of course, if you think the earth was thrown together by random interactions governed by the laws of physics, you are prone to look at it as a simple system. As someone who thinks the earth has been marvelously designed, however, I expect it (and the processes that govern its life) to be much more complex. That, of course, is what serious science tells us. * NOTE: Blue water footprint measures the amount of ground and surface water that is used up, taken from one body of water and returned to another, or taken from one body of water and returned to the same body at a later time. My dad also pointed out to me what happens to the ground when you switch from cattle to crops like corn or even soy (staples of a vegan diet): you destroy the top soil at an unsustainable rate. The hay and grasslands cattle require preserve the nutrients and even enrich the ground in a way no organic farming techniques can match. What assumptions differ in the two studies, and do you know if one set makes more sense than the other? I think the study featured in this article is more thorough, and as a result, there are fewer simplifying assumptions. Thus, I think it makes more sense. However, I did want to point out that other studies have come to different conclusions, which once again shows that there isn’t anything simple about this issue. I would have to disagree with you when it comes to the consequences of something being assembled randomly. For example, consider this image. 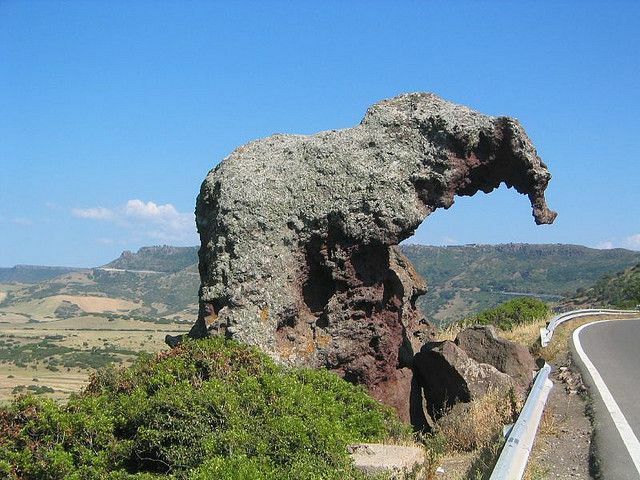 The rock looks like an elephant, but it is the result of random processes guided by natural laws. Now look at this image. It also looks like an elephant, because it is designed to look like one. Which is the simpler visage of an elephant? The one that is the result of random processes guided by natural laws. Do you know how many of these positive feedback mechanisms end up in the global temperature models? In particular, is the supposed contribution to global warming of lower coccolithophore populations large enough to be included? I guess I’m wondering how much of the alarmist temperature projections are riding on positive feedback mechanisms that may not actually be there (like carbon permafrost feedback). That’s a great question, Jake! As you say, the idea that thawing permafrost will release more greenhouse gases, exacerbating warming is a common one. However, the most detailed study done on this issue indicates that thawing permafrost doesn’t release carbon. Another common one is water evaporation. Since water is a greenhouse gas, as temperatures rise, more water will evaporate, which will cause even more heating. However, increased evaporation also causes increased cloud cover, and clouds aren’t accounted for realistically in any climate model. Albedo is another. Ice is more reflective than dirt and water, so as ice melts, less light is reflected, and more light is absorbed. One of the reasons there are so many different models that make quite different predictions is that they each deal with these (and other) feedbacks in many different ways. Exciting News in the Energy World This is So Cool!